When I was younger my mum took me to see Disney on Ice for my birthday, I think I must have been about 12. Yes Disney on Ice has been about for THAT long. I loved it and it is one of the fondest memories I have of my childhood. Especially the snow cone. Strange the things that stick in your mind. As soon as the boys were old enough I took them to see Disney on Ice. We went a few years ago and travelled down to Sheffield to see it. This time however Disney on Ice is coming to Glasgow. Well Glasgow and loads of other places. But the main thing is we are going this Saturday to see it. Are you going? I’ll be back to tell you all about it. 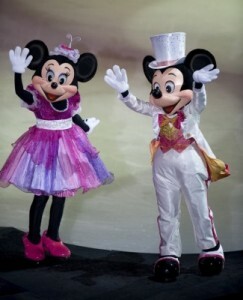 Disney on Ice presents Worlds of Fantasy will whisk audiences away to four magical locations on an action-packed tour led by Mickey Mouse and Minnie Mouse, showing nationwide starting 5th March 2014. 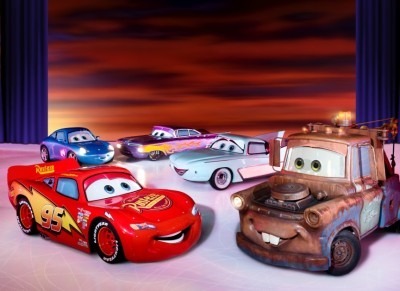 Produced by Feld Entertainment, Disney On Ice presents Worlds of Fantasy is a captivating adventure taking Disney lovers across the auto-racing terrain of Cars, Andy’s bedroom for some Toy Story 3 fun, under the sea with Ariel from The Little Mermaid and into Tinker Bell’s mystical Pixie Hollow. The on-ice excitement begins when Mickey Mouse embarks on an adventurous journey with Minnie Mouse to uncover each world of fantasy, but the plan goes awry when their cherry red roadster unexpectedly breaks down. Although Donald Duck and Goofy try, it takes the assistance of the coolest Cars on the ice to get the pistons firing again. Mickey and Minnie’s “road trip” continues by diving into Ariel’s fluorescent, coral-covered world in The Little Mermaid and into the colourful fantasy land of Disney’s Fairies for the Tinker Bell segment. Each life size car took 2,000 man-hours to build. 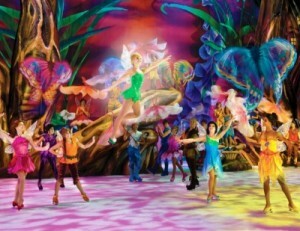 Disney On Ice presents Worlds of Fantasy is the first show featuring Tinkerbell’s story live on ice. Disney On Ice presents Worlds of Fantasy features choreography by Emmy Award® winning choreographer Sarah Kawahara and lighting by Emmy Award®-winning designer Peter Morse. It takes over 12 hours to set up the show in each new market. 13 production trucks are used to take this show from city to city. There are 79 different paint colours in the show. Tickets are available now and are priced from £18-£45 plus booking fee. Disclaimer:- I have been given 4 tickets to go and see the show in Glasgow and I can’t wait.